With the Axure Share Slack app, get notified in Slack of all activity on your Axure Share projects: new, resolved, and unresolved discussion comments for all projects, and check-ins and changes to your team projects. Receive all notifications in a single Slack channel, or choose a target team and channel for each Axure Share workspace or project. To install the Axure Share Slack app, first log in to your Axure Share account at share.axure.com. If you don't yet have an Axure Share account, learn about the Axure Share Basics here. 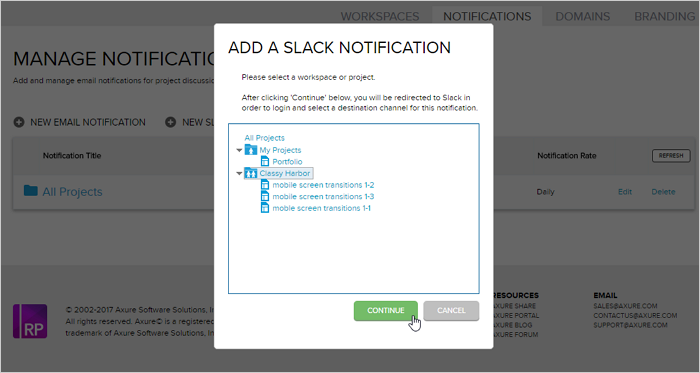 Switch to the "Notifications" tab, and click "New Slack Notification" to get started. You will be redirected to Slack to log in (if you aren't already logged in via your browser). 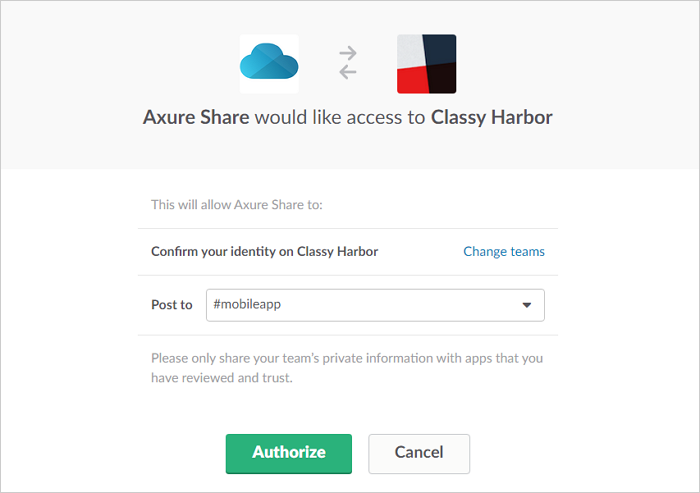 Choose the Slack Team where you want to see the Axure app. Then, choose the channel you want the notifications to appear in and click "Authorize". You will be redirected back to Axure Share, where you will see your new notification on the "Manage Notifications" page. You can view and edit your existing Axure Share notifications on the "Notifications" tab. To change the channel used for a Slack notification, click "Change" next to the current channel name. 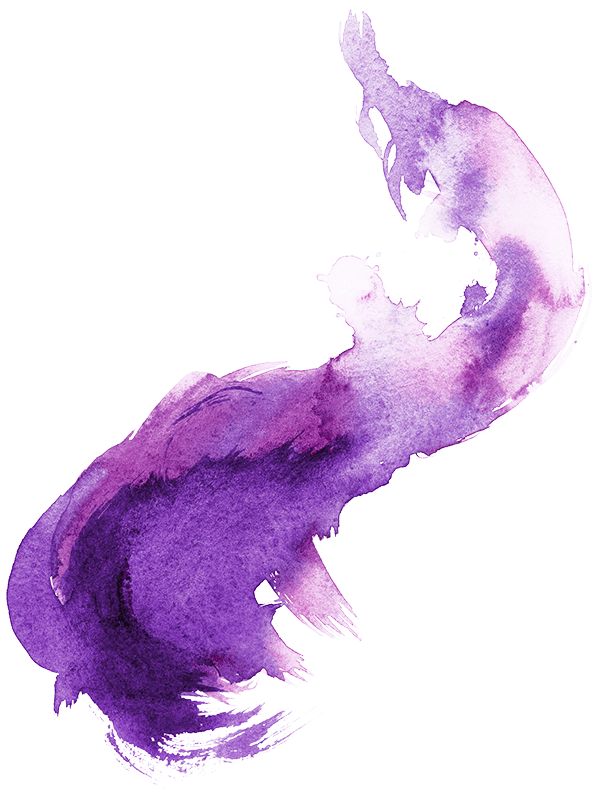 To change the project or workspace that sends a notification, click "Edit". If you no longer need a notification, click "Delete" to remove it. 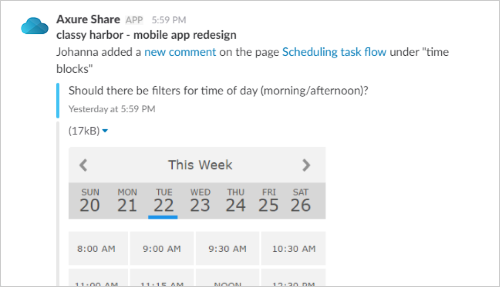 When you return to Axure Share, you can repeat the same steps above to add more notifications for different workspaces, projects, or Slack channels. Choose the workspace or project you want to be notified about, and then click "Continue".